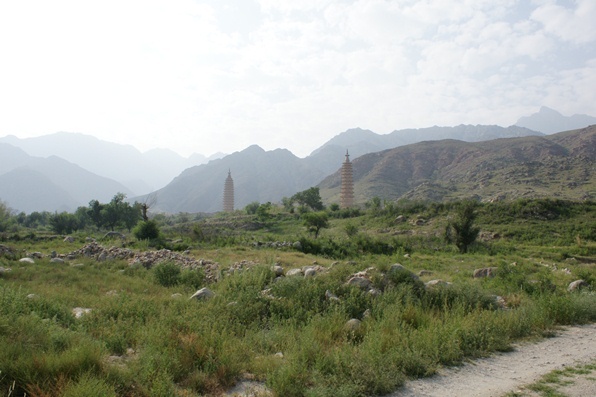 The Main landmarks within suburban districts of Yinchuan are: the Drum Tower, South Gate Square, Yuhuang Pavilion, the City Mosque or Nanguan Mosque, the North Pagoda and Temple (Haibao Ta) which are situated 2 kilometers outside of the Old Town proper and The Ningxia Provincial Museum with exhibitions on both the long history of the region and the details and riches of the Hui Ethnic Culture. Most visited among the main tourist sites in the wider region of Yinchuan City are the Xixia Wanling or the Mausolea of the Tangut Emperors, the Helan Shan Rock Carvings and the nearby Twin Pagoda's of Baisikou. Although reasonably classified as obscure, the Twin Pagoda's are rare historical relics from an era about which not much is known. Hence their great value. Other tourist attraction include the far away Sha Hu - Sand Lake area, the Western Film Studio - which is highly popular among Chinese and the remnants of the Great Wall of China. Minor temples, ruins and other jewels may be found throughout Ningxia Region. For More information on Landmarks, Monuments and Scenic Spots in the wider Region of Yinchuan, please refer to: 'Landmarks and Monuments of Ningxia Hui Autonomous Region. Train and Long-Distance Bus Lines connect to all destinations within this smallest 'province' of China. For more Information read: 'Transportation in Yinchuan (& Region)' and 'Transportation in Ningxia Hui Autonomous Region'. Although their twin Monasteries no longer exist, levelled to the ground as recently as the during the Cultural Revolution Era (1966 AD - 1976 AD), the remaining Twin Pagoda's of Baisikou are considered the two most splendid examples of Pagoda architecture of the Tangut (Xixia) Era (1038 AD - 1227 AD). Although of different ethnic origin, the Tangut had earlier lived in close connection with the Han Chinese and ancient trading pathways (later dubbed the silk road) ensured the arrival of buddhism in their realm. In fact, the Xixia and their Kings were devout buddhist and the Xixia way of life was centered around the teachings of the Buddha rather than the Islamic rituals and rules of today. Hence, among things their construction of elaborate temples, monasteries and to aspire to higher levels of wisdom, some very fine stone pagoda's. 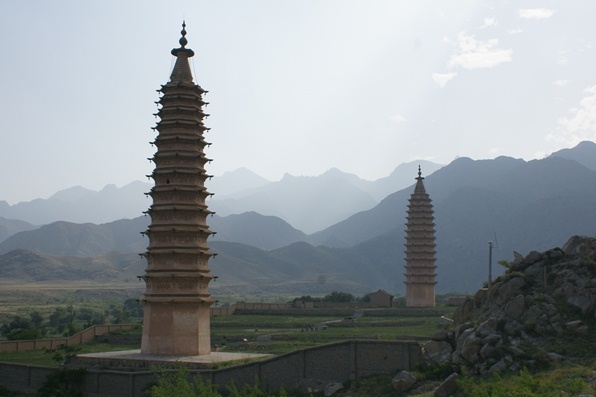 The splendid and rarely well preserved Twin Pagoda's of Baisikou in Ningxia set against the backdrop the Helan Mountains and the Bai Kou pass. Even without their accompanying monasteries they are a spectaculair site. Pagoda inside of the Chengtian Monastery (承天寺) and the double pagodas of the double monastery Bai-Kou 拜寺口寺 which stand some 50 kilometers from the City of Yinchuan. The two remaining others are all found far further to the West in the adjacent province of Gansu, and are the Ganying Pagoda (感應塔) in the Huguo Monastery (護國寺) in Wuwei (威武); and the Pagoda of the Monastery of the Reclining Buddha (Wofosi 臥佛寺) in Zhangye in the Hexi Corridor of Gansu Province. All four have their charms but the Baisikou Pagoda's are unique because of their origin as attached to the summer palace of the Tangut (Xixia) Emperors which was located in the refreshing air at Bai kou. According to historical records Baisikou once served as the summer resort of Emperor Li Yuanhao of the Western Xia. As part of a Monastery attached to the Royal Palace the twin pagoda's are of exceptional design and extra-ordinary beauty. Their survival to this date speaks of the soundness of their design and construction. 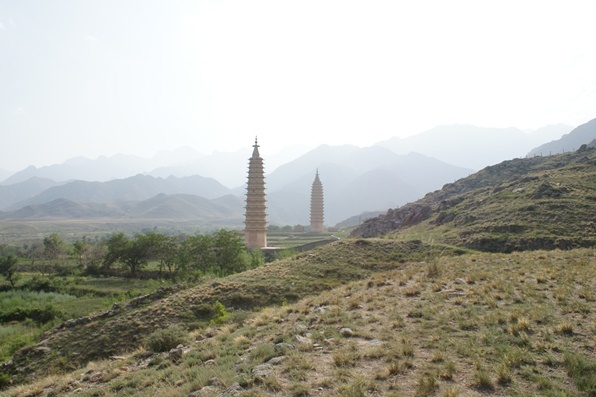 Baisikou's Twin Pagoda's underneath the Helan Mountains of Ningxia are the two most splendid of the total four remaining pagoda's surviving from the Tangut Empire and Era. belonged to a seperate Monastery, which standing side by side were known as the Twin Monasteries (associated with Bai Pass). 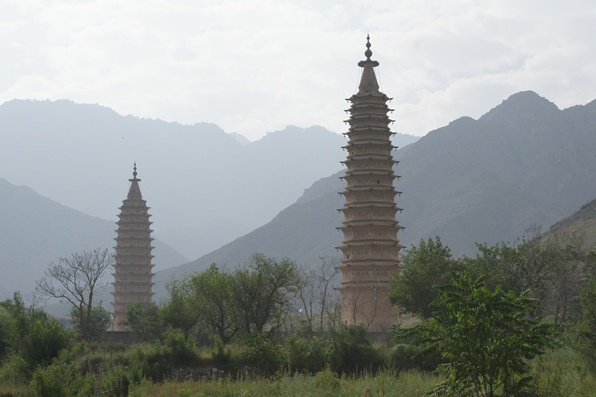 The two pagoda's stand only 100 meters apart and at first glance seem shaped nearly identically. Nothing could however be more untrue. The main difference is that for reasons of visual esthetics and perspective, the west pagoda (which is farthest away) is more bulbous and slightly higher. It reaches 41 meters and has 14 storeys. The east pagoda is only 39 meters high, has 13 storeys and is straight and conical. Furthermore, the bulbous west pagoda has niches on each of its octagonal side, whereas the thinner east pagoda only has niches on the east and west side of its 6th tier. In case of the larger west pagoda the center each wall surface allows for a rectangular shallow niche containing a statue of the Buddha. Also inside the niches are painted animal carvings and the so called Eight Treasure Designs. The decorative stone patterns and statues cover the entire body of the pagoda. The construction of each pagoda rest on a solid stone base pedestal. The base segment is rather high and has a door facing south, which leads into the pagoda. The top has "Thirteen Heavens" which means that apart from their octagonal base, both stone towers are intended to count or suggest a total of 13 stories suggesting the 13Th Heaven. One Pagoda counts 13 layers the other one carries a culminating spire shaped as a Dagoba, thus suggesting Nirvana. From base to top the storeys become progressively smaller in size and width as they are nearer the top. Each of the 13 layers including the base carry colorful copper bells on a protrusion coming off each corner. Inside the pagoda each tier caries colorful paintings.The sixth storey of each pagoda has small niche on both sides, east and west. The Top is formed by a Dagoba shape, with a brass spire riding atop. Old Photos show that the spires are the result of restauration works carried out on the towers. 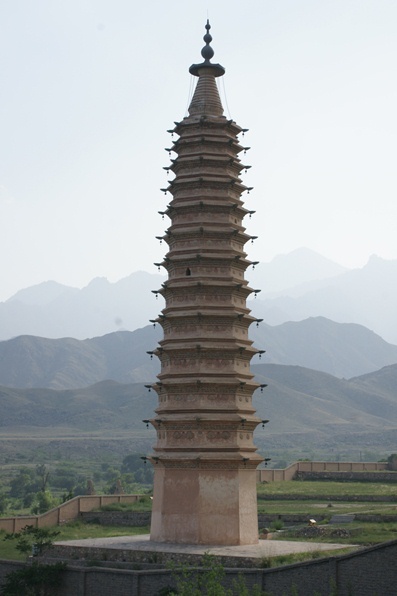 Closer view of the smaller 39 meter high eastern pagoda of Baisikou. Recent restorations have repaired much of the damage done to eaves and spire. Of their monasteries only the foundations are left, clearly traceable within the walls that surrounded the complex. The walls date from a more modern age and have been erected in order to protect the site as well regulate visitors. Officialy, a story long held is that the monasteries were destroyed in earthquakes that happened long ago during the Ming and Qing Dynasty Era's. Local citizens however knew the true story. According to them the monasteries were intact until one night during the Cultural Revolution Era they were ransacked and burned to the ground. As it has since been revealed the twin pagoda's were part of a far larger complex, namely nothing less than the temple complex attached to the Xixia Royal Summer Palace. When in full function during the Xixia (Tangut) Era (1038 AD - 1227 AD) the temple grounds covered no less than 400 square meters. The summer palace and this temple complex were built during the first reign of the Xixia Dynasty (1038 AD - 148 AD) and at the time there were over a 100 temples. Hence the name of the pass as Bai Si (100 temple) Kou (Pass). Today the name is written in the same way but pronounced slightly different as Bai Si Kou, is white temple pass. Walk around the ruined site almost at will trudging through unused lands on the valley floor. Apart from the remaining two pagoda's there are the ruins of about 60 stupas within the courtyard. Other remains are merely tiles, column bases, drainage pipes, and shards. Less easily noticable, on the face of the north slope above the pagoda's is the huge natural image of a face resembling the buddha. The pagoda's have been constructed to stand on both sides of this image. On the west side of the north slope behind the pagoda's there are more temple ruins which stand atop a platform. This is known as the 'Grand Temple Platform' and offers a grandiose view of the Pagoda's and temple ruins below. Situated underneath the Helan Shan Mountains at the entrance to what is known as the Bai Kou (Bai Pass), the Pagoda's stand tall surrounded by lush greenery and away from any nearby center of civilization. Even today it is a splendid spot, perfect to spend an afternoon and see the sun go down in the west casting on amazing light on these ancient giants. How to get there: The Baisikou Pagoda's are located far out and away from Yinchuan in the foothills of the steep Helan Shan Range. There are various ways of getting there, one more complicated than the other. It should be noted that the actual site of the Pagoda's is located some kilometers due south along the mountain from Helan Pass. In the oppossite direction to the North are the Helan Shan rock paintings and the associated Museum. In other words, travel directions for both are about the same minus the last few bits. The easiest way to reach the Pagoda's is to hire a Taxi and go. Another option is joining a tourbus ride to see both the Baisikou Pagoda's and The Helan Rock Paintings, the latter always being first on the program. More complicated and adventurous is taking the Bus up to the Pass and beyond to Bayan Hot. Baisikou Pagodas from afar. Sparsely inhabited lands and roughs make up the valley floor. the Baisikou Pagoda's themselves. However, this may give you the option of camping out and staying overnight, thus gettting the best photos and views of the Pagoda's and the green Ningxia Plain set against the rising desert sun.